See article by Chet Falzerano online at http://www.drummagazine.com/gear/post/w.w.ii-classics-drums-without-metal/ (originally published in the February/March 2000 issue of DRUM! magazine). Credit: NMM 3011. Parade drum by WFL Drum Co., Chicago, ca. 1942. Views of the mahogany shell, the metal screw strainer in a wood brace, and the drum's patented Strupe internal tension. 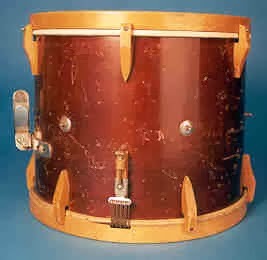 This drum model was developed when restrictions on the use of metal in the manufacture of musical instruments were created at the beginning of World War II. Drum manufacturers were forbidden to build instruments with more than 10% of the total mass of the instrument being made with metal. 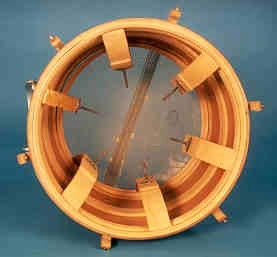 The implementation of this unique wood tensioning device allowed the WFL Drum Company to stay within that narrow limit. Arne B. Larson Collection, 1979. http://orgs.usd.edu/nmm/WWIIdrum.html.